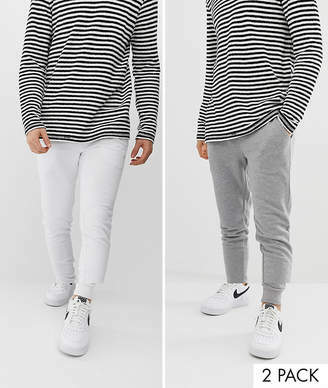 Joggers pack by ASOS DESIGN, Pack of two, We know you like options, Drawstring waistband, With metal tips and eyelets, Side pockets, Fitted cuffs, Skinny fit, A tight cut for a sleek shape. Giving you the confidence to express your individuality, ASOS DESIGN takes major trends, adding the freshest ASOS spin. All the gear you need including in our fit ranges Plus and Tall and our ASOS DESIGN Makeup collection to create your coolest look, then switch it up again tomorrow. Make every day, night and everything in-between as extraordinary as you are.